Google “learning management system” and you’ll see about 683,000,000 results. 30 years ago, there were only 15 LMS vendors. Now, there are more than 700. How can you decide which one to choose? We asked eLearning experts and users and defined eight LMS features every system should have. Let’s check out each of these criteria in more detail. Brandon Hall Group found out that half of the American companies that use eLearning, would like to change their LMSs. The main reason, cited by 86% of the respondents, was a complicated interface. Once users head over to a learning portal, they need to immediately understand how to log in, where the learning content is, and how to find out their test results. If users have to click more than 10 times to open an e-course, the learning process will take too much time. Get started with a trial of an LMS to evaluate its interface. Try to explore the system from both the admin’s and the users’ points of view. From the learners’ point of view: Is it clear where to enter your login and password? How do you open the course catalog? How do you find out about upcoming events? How do you see test results? How do you message another user? From the admin’s point of view: Do you understand how to enroll users and how to add and edit training materials? How do you assign training courses to employees? How do you create a learning path and track the progress of employees? Do you have to look up technical documentation all the time to sort out the LMS features? Ease of use is an important criterion not only for end users but for system administrators as well. Analysts from Brandon Hall Group also found out that 74% of companies are considering changing their LMSs due to difficulties with managing the system. The idea of getting started with learning management systems is to simplify the learning process, not create more of a headache. So, it’s better from the start to choose a platform that doesn’t take a long time to master. In that case, you won’t need to staff up and hire a system administrator, as everyone will be able to manage the system. For example, it took just one day for Aquario, a supplier of pumping equipment in Russia, to launch iSpring Learn LMS and understand how it works. “We don’t need technical specialists to manage and maintain our learning management system, as everything is easy and clear. There’s also a list of the top 20 LMSs based on user experience. Experts from the eLearningIndustry.com online community asked actual LMS users to evaluate 316 LMSs in three ways: ease of use, perceived usefulness, and user loyalty. As a result, they selected 20 platforms with the highest scores. Imagine that you’ve assigned learners a course, and they cannot open it. System errors and failures annoy users and make it difficult to learn, so choose a platform that will save all statistics, and won’t go down when 1000 employees log in at once. The problem is that you’ll be able to evaluate the LMS’s reliability only after setup. However, there are two rules of thumb that can help you to make a better final decision. “Give the demo version a try. Use it in the way you expect it to use in the future: load the system as much as possible and test-drive all the necessary LMS features at maximum. If there are failures at this early stage, it’s better to look for another platform. Study reviews from companies that have already used a vendor’s platform, or (even better) contact them. Normally, during the trial period you can add only a few users, and of course, the platform works perfectly. However, once you get something like 200 learners logged in at the same time, the system can easily freeze up under the load. Content is king, so it’s better to think beforehand what type of activities you’re going to use to keep your learners coming back for more: presentations, quizzes, video lectures, or instructor-led training. It’s especially important when you already have some learning content. If it turns out that the LMS doesn’t support crucial formats, you’ll have to spend extra money, time, and effort to convert files into the formats your LMS can read. Before making a purchase, find out what types of eLearning content the LMS supports. For example, if you have a lot of PPT presentations, make sure that the system allows users to view slides. If you are going to train employees with video lectures, make sure the LMS is compatible with video files. If you’re going to develop interactive e-courses, check the LMS for compatibility with eLearning authoring tools: iSpring Suite, Articulate Storyline, Adobe Captivate, and Lectora. Another important thing to ask vendors about is the storage, and if there are limits. Of course, it’s better to choose an LMS which allows you to upload as many courses as you need with no limits. However, some vendors charge an additional fee for that. Even people who do the same job may have different skills and needs, and what a waste of time it would be to make an employee study something s/he already knows. Not to mention that the “one size fits all” approach is useless when it comes to teaching employees with different areas of expertise. For example, Oticon, Inc., a global hearing aid manufacturer, trains 250 employees with different backgrounds and professional experience using iSpring Learn LMS. To learn how to create effective learning paths is iSpring Learn LMS, watch a video. Another pitfall you need to avoid is unclear (or the absence of) user roles and functions. If a training admin has the same permissions as a learner in the system, order disappears and it can compromise your data security (including test results). A good LMS allows you to assign users different roles. The hierarchy somewhat resembles a military command structure: the higher the rank, the more permissions. This helps you control the quality of training and creates a sense of order. An LMS administrator can be sure that none of the learners are faking results; they simply won’t be able to do so. One of the biggest advantages of using an LMS is full control over users’ progress. However, some systems still have poor analytics. For example, you can see how long employees studied the course and their final score for the test, but there’s no way to find out what questions were answered incorrectly. A modern LMS should provide you with detailed statistics on learning content and learners’ progress. Before signing a contract with a certain vendor, find out how many types of reports there are in the system, whether you can create custom reports, and if you have to pay extra to enable advanced reporting. FYMCA Medical uses iSpring Learn to train doctors from Panama, Nicaragua, Ecuador, and other countries with low income. One of the reasons why they chose iSpring was the advanced reporting LMS features. “It’s very important for us to be able to monitor engagement with the content because we are trying to identify the new leaders of the future who are really dedicated to this field of medicine, and train them up with adequate knowledge. Detailed analytics also help you determine which learning content is the most useful and which should be improved. For example, you may analyze users’ answers on a test and find out that they all stumbled on the same group of questions. That would mean that either the explanation in the course was poor or the questions weren’t clear. Read this guide on LMS reports to learn how statistics can help to improve learning efficiency. The results of a survey by Merrill Lynch showed that 32% of learners study during business travel, 24% while commuting, 26% at home, and just 18% in the office or elsewhere. Learning is going mobile, so choose an LMS that supports mLearning. To avoid unpleasant surprises, make sure that your learning content in all formats is properly displayed in different browsers and on different mobile devices. The ideal option is to choose an LMS with a mobile app for the three major platforms: iOS, Android, and Windows. It’s very useful when the app also supports offline mode. With this feature, users will be able to learn even if there is no Internet connection. Deloitte is an international advisory and audit company that uses mLearning to train its auditors. “Our employees are highly overloaded. They take part in several projects at the same time and have to cope with a large volume of information. That’s why mobility is really important. Let’s face the truth: people don’t want to study. You need to encourage employees all the time so that they actively take courses. One of the most effective ways to engage learners is enhancing training with game mechanics. An LMS should allow you to use gamification. Learners become more engaged in learning when they can track their position among their colleagues, and earn points and awards for completed tasks. For example, MW-LIGHT, an international manufacturer and distributor of decorative lighting, added an element of competitiveness and increased their employees’ engagement from 15% to 60%. “We use eLearning to train our own retailers and merchandisers who work for our wholesale partners such as Leroy Merlin, OBI, Castorama, Maksidom, and Hoff. The problem was that only 15% of the wholesale companies’ employees studied; the rest simply ignored the e-courses. Even instructions from supervisors didn’t work. Another way to motivate employees is to issue electronic certificates for the courses they have completed. This technique is used by AG Experts, an international chain of retailers that specialize in the repair and replacement of autoglass. You can also increase employees’ motivation with the help of social tools built into an LMS. People digest content better when they collaborate with other learners: share opinions, ask for advice, and get feedback. That’s why it’s a big plus when your system offers you integrated forums, chats, and the ability to post, comment, and assign experts who can answer questions from employees. Imagine a situation where you’ve created some e-courses, but were unable to upload them to the LMS. You tried to contact tech support, but only got a robo-menu. Finally, five days later, you got an email with a promise to fix the problem soon; and you have a large assessment in a few days that is impossible to reschedule. It can drive anyone crazy when you get a generic reply by email instead of real help. Quick reaction. Operators respond promptly to requests. Effective troubleshooting. Operators successfully solve any problems. Availability. Operators can be reached in a convenient way: by phone, Skype, email, or messengers. You can also use Capterra’s advice to find an LMS with good support. This website posts reviews and feedback on 400 categories of software for business, including LMSs. One of the main criteria the LMSs are rated on is user support. Once a year, Capterra picks several LMSs with the world’s best technical support. In 2017, the award went to iSpring Learn. The iSpring team communicates with customers in real time over the phone, via chat, and by email. According to the statistics, 83% of users’ issues are resolved within the first two hours after their request. 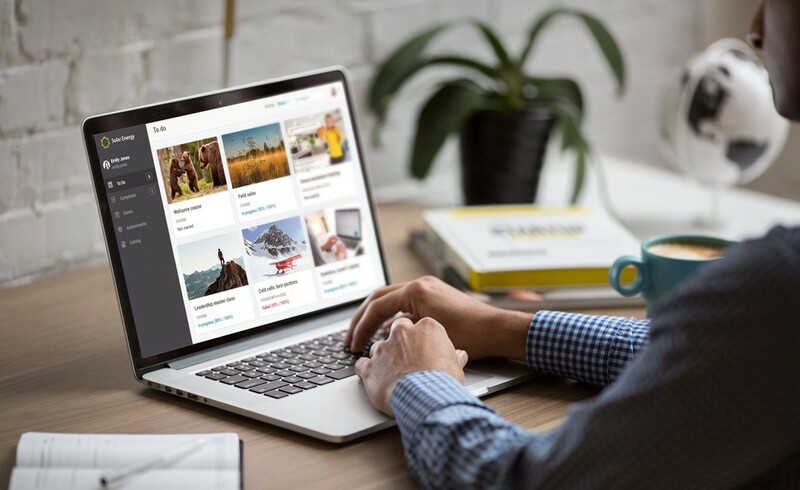 Here we’ve described eight key LMS features each learning platform should have, and hope that this article will help you choose the best system for your learning project. To help you select the right LMS, we recommend you download this checklist, which includes all the essential requirements for a modern learning platform. Make the process easier by sending the list to the LMS vendors that appear to meet your needs and asking them to mark the features they offer. Meanwhile, prioritize the features according to your specifications — for example, key, nice to have, and not important. Then, compare your list with the ones you received from all the vendors. This simple technique will help you make the right decision. Choose an LMS that is easy to use for both admins and learners. Find out whether the LMS offers individualized learning paths. Find out whether you’ll be able to give users different roles. Choose an LMS that supports mobile learning. Check out what types of files the LMS supports and if there are any storage limitations. Find out what types of reports the system is able to provide, and if you can create custom reports. Find out what motivation tools the LMS offers. Ask vendors what their tech support includes, and read user reviews on independent websites.